Landing in Leh Airport, you will be welcomed and invited by our Representative before continuing for Hotel Check-in. Since you've got arrived by air, we have a tendency to strictly advise to relax & conform with Leh weather & altitude. Take full day rest & change for approaching journeys. After Breakfast, get ready to trek theWorld's Highest Motorable Road - Khardungla (5359m). Touch the summit, have a cup of Tea, get clicked & return to Leh. Later visit Leh Palace, Shey & thiksey Monastery during the day. 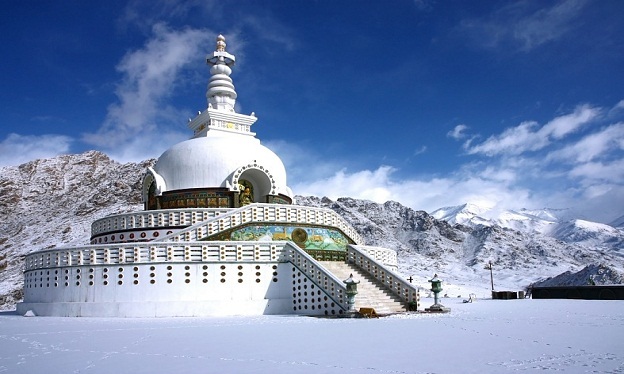 You may like to visit Shanti Stupa in the evening. Overnight stay at Leh. Drive for Khardong la Pass, which is the World's most bewildering motorable road running at 18380 feet. Return to Leh toward the afternoon, and welcome a Hot Lunch at the lodging. After Lunch one is free to stroll around the local market at to one's disposal. Overnight remain at Hotel. This is the nostalgic moment of the Tour when you have to bid adieu to this beautiful place, knowing in your heart that one day you will come back here again. After early Breakfast, checkout from Hotel & transfer to Airport for onward flight back home, with everlasting memories.